My name’s Carl, I am 32, a dad of 3 wonderful children and husband to my lovely wife. Life was great, I had my own business and was living life to the full, I was really into downhill mountain biking and have been for a long time. I was enjoying racing with mates and seeing great places, it's all part of the experience and made me feel alive. So I was really enjoying myself up in Scotland in May 2016, it was really nice weather too. It was my first time there. Me and my friend Matt were racing in the British downhill series at Fort William which is a world cup track, something I've wanted to do for a long time, one of my bucket list things to do. I was doing well on the beast of a track, I was cautiously learning it section at a time like we do, and by the end of the few days was confident and hitting every jump, obstacle and feature with confidence without any dramas, it all was going to plan until my seeding run when I went over the bars after landing short after a drop off, that was when my world changed in a split second, I had broken my back and severely damaged my spinal cord. I thought to myself about what had happened and what I needed to do. The next few months were very difficult for me. Learning how to be independent and manage my health and the associated things that are linked with a Spinal cord injury. 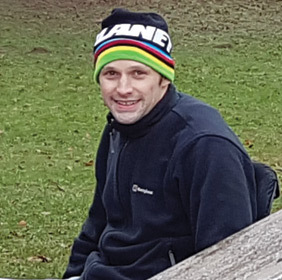 It was in the later stages of rehab when I started to feel more like me again and I decided to phone around charities for funding to get me back on two wheels just like Martyn Ashton’s electric downhill bike. I was given the name of the Matt Hampson Foundation as they specialised in funding for young people injured in sports so I thought I'd try my luck thinking I wouldn't tick the boxes with my proposal, how wrong was I?! A few weeks after discharge I was sat having a coffee in a restaurant with Tommy from the charity and he was happy with my request and would pay for a special seat and motor kit for my bike, I was so happy with this I nearly cried. It has given me something too look forward to and really wouldn't of been possible without the Matt Hampson Foundation for which I am extremely grateful. Thank you.